A new Hollywood epic on the life of Noah has stirred controversy among Christians, Jews and others who have pre-screened the film, as they state that the movie largely leaves out one important foundation: the Bible. Noah is the brainchild of producer Darren Aronofsky, who says that he has wanted to make a film about Noah and the ark since his childhood. With a $125 million budget, the film is said to be more of an edgy action epic that depicts a man who fights off his enemies as he prepares for a coming apocalypse, rather than a story of a “preacher of righteousness” who calls the world to repentance from sin. Russell Crowe, known for his roles in Gladiator, A Beautiful Mind and Robin Hood stars as Noah in the film, and Anthony Hopkins, known for his roles in Silence of the Lambs, Hannibal and The Legends of the Fall appears as grandfather Methuselah, who provides advice to Noah. But as Noah begins to build an ark, he becomes the enemy of his brother-in-law Tubal-Cain. He tells Tubal-Cain to build his own ark, or die trying to take his. “I’m not alone,” Noah replies confidently. Tubal-Cain, who has gathered an army against Noah, later storms the vessel in battle-style as the rain begins to fall. “Take the ark!” he orders his army of followers. Earlier reports of the film expressed disapproval that Noah was depicted as being centered on an environmental agenda, and that Aronofsky viewed Noah as the “first environmentalist.” Noah is also stated to be tormented with guilt for surviving the flood while others perished. It is not known whether those particular aspects still remain in the movie at this time. As Aronofsky and Paramount Pictures have rolled out screenings of the film, which will officially hit theaters in March 2014, there has been mixed reaction from viewers. 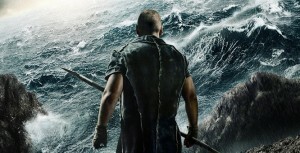 Some have praised Noah, stating that they were impressed with the production, while others have expressed disappointment over the movie’s departure from the Biblical text. Reports state that Paramount and Aronofsky have different visions for the film, and that due to some of the dissatisfaction from the screenings, the producers of Noah are working on making their final adjustments before its release next year. Some are hopeful that the changes will be more in line with Scripture.